artichoke extract is one of our best ways of lowering cholesterol. We use the leaf of the plant as medicine. So I talked about food last month, and tried to dispel some of the myths about what you should and should not eat. This month, I’d like to recommend five ways to use supplements to reduce cholesterol. As always, I like to start with the ones that are the most holistic, that have the most side benefits, that best promote a state of general health in addition to dropping your cholesterol. For those who prefer the quick fix, I’ll eventually get to the ones that are quick and easy and efficient, and can drop your numbers in two or three pills a day. The un-sexiest nutrient shines once again! Fiber may not be on the “cutting edge,” but it works. In fact the research is so overwhelming, I don’t want to take a lot of space going into it all. Just remember, first, that you don’t actually need supplements to get fiber. It’s easy to replace lower-fiber foods (fruit juice, refined grains) with higher-fiber alternatives (whole fruit, whole grains). And since fiber works best when taken with meals, this certainly makes things convenient. Second, while all fiber is good, soluble fiber is the most effective type when it comes to reducing cholesterol. So how can you tell which kind you’re getting? Well, if you’re buying supplements, the bottles should tell you which you’re getting. But what about carrots, then? What about oats? Instead of finding a list, and memorizing it, just bear in mind that soluble fiber is, well, soluble: it dissolves in water. So think of oatmeal getting all gluey when you cook it, or apple pectin which helps jellies to gel, beans and barley which thicken soups: that’s soluble fiber at work. On the other hand, think of wheat bran, which doesn’t dissolve in water, vegetables like lettuce and carrots which stay intact no matter how much you cook them: these are sources of insoluble fiber. Incidentally, fiber reduces cancer risk, keeps you regular, controls weight, and helps manage diabetes. The more time I spend with fiber, the more I’m beginning to think it belongs up there with fish oil as something everyone, everyone, everyone should be getting by the bucketful. (Legal disclaimer, for the painfully literally-minded: I am not actually endorsing eating an entire bucket of fiber, or drinking an entire bucket of fish oil). Of all the things on this list, fish oil is probably the weakest when it comes to reducing cholesterol. But even though fish oil’s impact on cholesterol is mild, it has additional protective effects on the heart. And with a list of side benefits that includes elevated mood, delayed Alzheimer’s, softer skin, milder sunburns, less joint pain, and reduced risk of risk of osteoporosis, there’s plenty of reason to take it besides. Look at the back of the bottle for the total amount of omega-3 fatty acids (a measure of fish oil’s strength), and shoot for at least 2,000 mg a day. An older generation of self-styled natural health pioneers would occasionally endorse heroic “liver flushes,” claiming miraculous, instantaneous cures. So you’d drink a pint of olive oil mixed with a cup of lemon juice, plus Epsom salts, for breakfast. Then you’d spend the rest of the day trying to visualize the state of glowing health you would soon enjoy just as soon as the crippling abdominal cramps would subside, and you could get up off the toilet. What I’m talking about here is a lot less aggressive. You gently encourage the liver to excrete excess fatty substances. This happens gradually and safely, over a number of weeks. In that time, you can expect not only to see your cholesterol drop, but your triglycerides as well. You’ll probably see your good:bad cholesterol ratio improve. And in the greater scheme of things, you’ll make your liver healthier. Whether you’re dealing with simple less-than-stellar liver function, or something more specific like fatty liver (where this absolutely shines), this will nourish, rejuvenate, and decongest your liver. Here’s a protocol I’ve found effective. With each of three meals a day, take one capsule of concentrated artichoke extract. (In our store, I recommend the Jarrow brand). 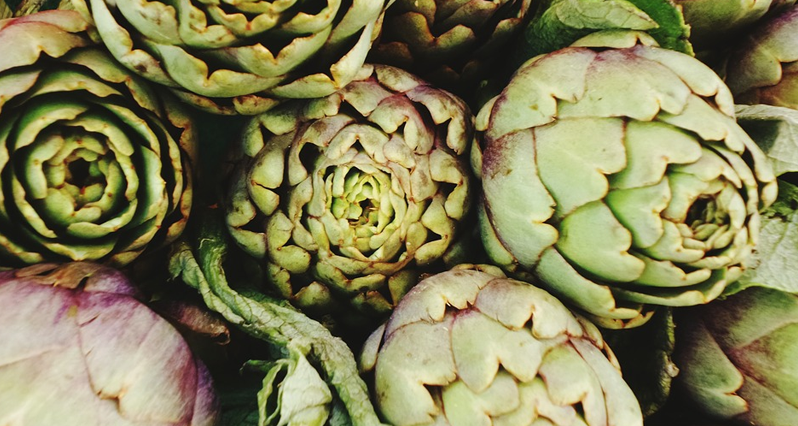 Rarely used in North America (outside of dip, that is), artichoke is a mainstay of European herbalism, where it’s used to promote liver function, and reduce cholesterol. There’s a fair amount of research where we see this happening. For example, one German study followed 143 adults with high cholesterol, who received either 1,800 mg of artichoke extract or placebo daily for six weeks. Those who got the artichoke saw their LDL (“bad”) cholesterol drop 22.9%, vs. only 6.3% with the placebo. Other blood lipids improved as well. I find artichoke works even better with the addition of lecithin, which I mentioned last month. Lecithin is an emulsifier, which is to say, it keeps fats soluble in water. This helps the body process them in general, and excrete them in particular. Think of it this way: while artichoke gives the cholesterol a push, lecithin greases the chute. With each artichoke capsule, I suggest four capsules of lecithin that contains 35% phosphatidylcholine, or one tablespoon of the granules (powder). Give it a month or two. It can be surprisingly effective. In people who feel cold, with poor circulation, I like to add a strong cayenne capsule with each meal. And while I said three meals a day, it won’t wreck the program if you miss one now and again. In my experience, red yeast rice is the single most effective supplement at flat-out dropping total cholesterol although not the most holistic especially in people whose high cholesterol is genetic. Red yeast rice (RYR) is rice that has been fermented with a yeast called Monascus purpureus, which turns the rice red. It has been used in both cooking and medicine in China for over a thousand years. In cooking, it is used primarily to color food. In medicine it was used primarily for things that had nothing to do with cholesterol. That all began to change about 30 years ago, when a Japanese researcher discovered that RYR contained statins, the same compounds found in cholesterol-lowering drugs like Lipitor, Zocor, and Prevachol. This discovery set into motion a chain of events which led not only to RYR becoming one of the best-selling cholesterol remedies on the market, but also one of the most contentious. In the 1990s, U.S. supplement companies began advertising RYR to lower cholesterol levels, touting their statin content. As you can imagine, this piqued the interest of consumers. But it also irritated the pharmaceutical companies. They had spent millions and millions promoting statins only to have their market share usurped by an unpatentable natural product! The FDA wasn’t thrilled either. The agency considered statins to be pharmaceutical drugs, and did not want to see them sold off store shelves. The agency also asserted that “cholesterol” was a disease, thus, claiming that a supplement could “prevent, treat, or cure” it was illegal. So in 1998, the FDA picked a company called Pharmanex to make an example of. Pharmanex made an RYR product called Cholestin. The FDA demanded they stop, but Pharmanex went to court, and won their case. That didn’t stop the FDA, however, which raided Pharmanex’s warehouse, and forced the company to destroy over $18,000 worth of Cholestin. While the pharmaceutical industry didn’t like their research and marketing dollars usurped by the natural product industry, the natural product industry (and traditional Chinese doctors) didn’t like seeing thousands of years of tradition usurped by upstart corporations, who basically marched in and said “this is ours now.” They fought back. (And actually, the law is clear on this: if it’s natural, if it has been used traditionally, and if it’s not dangerous, then it can be sold. As for the claim that cholesterol is a “disease,” it isn’t. Cholesterol is a blood marker that indicates the risk of diseases, i.e. heart attacks and strokes). While research does indicate that RYR can be as effective as statins, without the same risk of side effects, I still like to try other things first. Like pharmaceutical statins, red yeast rice inhibits an enzyme in the liver called HMG Coenzyme A reductase, which is involved in producing cholesterol. HMG CoA reductase also produces a number of substances which are useful to us, such as heart-healthy coenzyme Q10. For this reason, I recommend at least 100 mg a day of CoQ10 for anyone who uses red yeast rice. I don’t recommend it for people with liver impairment. And I recommend trying some of these other measures first. That being said, the standard dose is 600 mg twice a day. And it does work. …are often very effective at reducing cholesterol, since they can approach the problem from a number of different angles. Some ingredients will lower cholesterol by keeping us from absorbing as much from our diet. Others stimulate us to excrete the cholesterol that’s already in our bloodstream. Still others reduce the amount of cholesterol we produce in our livers. Still others work via more indirect pathways. While there are 101 good combination formulas out there, I’ve begun developing a real appreciation for one in particular called Guggul-Rose, put out by the White Tiger brand. While I have not yet gotten feedback on this one myself, it’s certainly very well put-together on paper, a simple and elegant four-ingredient formula. Just looking at it, I would expect it to be especially effective for anyone, but especially for people with a slow metabolism, a weak heart, underlying inflammation, or a bad cholesterol ratio.